A wilderness the size of Yosemite National Park narrowly escaped devastating mining when it was declared a Biosphere Reserve by the United Nations in July. Encompassing 700,000 acres in northwestern Ecuador, the area includes cloud forests critical to orchids, hummingbirds, and Spectacled Bears (cover image). The Chocó Andino de Pichincha reserve connects two megadiverse ecoregions: the unique western rainforests known as the Chocó, and the rugged Andean forests in Pichincha province. The El Pahuma Orchid Reserve, Ceiba’s first conservation project, lies in the biosphere’s pristine core. El Pahuma’s success sparked the growth of a grassroots network of local people who are demonstrating that forest conservation can support families and improve livelihoods. While still in its adolescence, this network of conservationists was forced to confront a monumental crisis. Mining interests were targeting the very forests these ecological entrepreneurs depended upon, and permits for the appallingly destructive technique of “mountaintop removal” had been issued. Alarm bells rang across the province, and a committed and outspoken opposition rose to confront the mining plans. Led by Mr. Inty Arcos from the local government, and bolstered by active participation of community members including Rene Lima from El Pahuma, as well as non-profits like Ceiba, the loose-knit coalition swiftly crystallized into a unified voice of opposition. 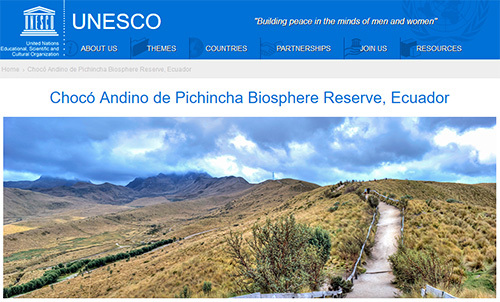 An ambitious strategy emerged: pursue an international declaration of the region as a Biosphere Reserve, and leverage the designation to force the Ecuadorian government to renounce its mining plans. Once the United Nations signaled early support for the reserve, the battle lines were drawn. An energized public launched an all-out fight to protect their forests against a federal government willing to deforest the landscape for short-term profits. Residents, linked through social media, set about petitioning and protesting to halt the mining, culminating in massive demonstrations denouncing governmental greed. And it worked. The Ministry of Mining relented; for the time being, the coalition had won. The Ceiba Foundation helped send two emissaries from Ecuador to personally make their case to UNESCO’s Man and Biosphere Programme, and a new reserve was born. The declaration recognizes the critical importance of this region for biodiversity, water purification, and climate change mitigation. It provides the impetus to protect amazing forests with hundreds of species of birds, frogs, mammals, and plants found nowhere else on Earth. The challenge now is to ensure that the designation can secure the livelihoods of local conservationists who will defend it for decades to come. Donate today to help us continue the fight! Three counties in Manabí, Ecuador’s largest coastal province, have joined Ceiba to plan a conservation and sustainable use zone protecting and connecting 69,000 acres of endangered tropical dry forest, a crucial step towards securing reliable sources of water for this parched region. San Vicente, Pedernales, and Jama counties are experiencing a surge in growth as people flock to the Pacific coast for its sunny beaches, warm waters, delectable cuisine, and shady forests teeming with birds and monkeys. But the expanding developments all require water, and streams fed by coastal forests are running dry during the region’s increasingly intense dry season. 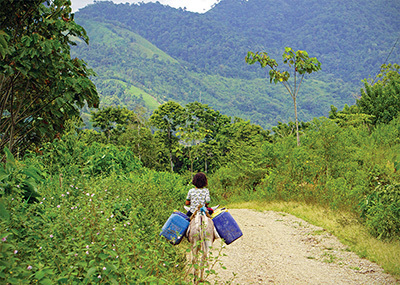 For years, the Ceiba Foundation has promoted preservation of these forests through conservation, education, and sustainable development programs focused around the Lalo Loor Dry Forest (in Jama county). Our message is being heard. Governments of these three counties are embracing creation of a Conservation and Sustainable Use Area (known in Ecuador by its Spanish acronym, ACUS) to stem deforestation while supporting farmers who adopt sustainable agriculture techniques like coffee under shade trees. The newfound support for this initiative is a culmination of Ceiba’s long-standing promotion of the Coastal Conservation Corridor (see our 2017 newsletter) to protect standing forests and encourage landowners to reforest linchpin parcels located between isolated forest patches. Corridors help wildlife move through the landscape to find mates, food, or climate refuges, and are essential to the long-term preservation of biodiversity in a rapidly changing world. In October, Ceiba won a $50,000 grant from the U.S. Fish and Wildlife Service to reforest 500 acres in key areas of the corridor. To achieve this goal our team will plant 130,000 trees, a major effort that will require the help of community nurseries to produce seedlings, and continued financing for long-term success. The dry tropical forest is home to wild cats, monkeys, sloths and anteaters, parrots and toucans, and the endangered gray-backed hawk. Less than 5% of Ecuador’s original dry forest remains, but the steps taken towards an ACUS are signs of a turning tide. With support from the local community, our donors, and grants, we can reverse the loss of forest, protect wildlife, and improve human livelihoods in this unique and threatened ecoregion. Donate a seedling or volunteer to plant trees! Trail cams are revealing the secrets of elusive wildlife in the Lalo Loor Dry Forest Reserve and surrounding forest remnants. Large mammals and ground birds are especially threatened by habitat loss and hunting. They are normally very reclusive due to the risks posed by poachers, but camera traps show they are surviving cautiously in the forest refuges that dot an otherwise dangerous landscape. Luis Fernandez, Ceiba’s science coordinator at Lalo Loor, directs the strenuous field work of placing camera “traps” in remote locations. 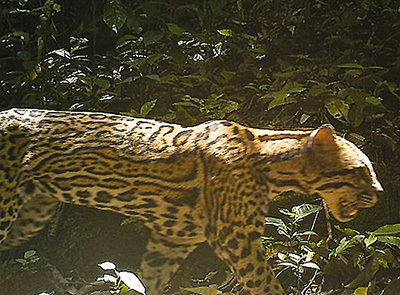 Among the charismatic species he has confirmed in the reserve are the ocelot (Leopardus pardalis, inset photo), jaguarundi (Herpailurus yagouaroundi, a small, spot-free cat), tayra (Eira barbara pictured above, a relative of badgers), and collared peccary (Pecari tajacu). This year, Luis began placing cameras 15 feet off the ground to survey species that dwell in the trees, and detected the elusive Derby’s Woolly Opossum (Caluromys derbianus), a nocturnal marsupial previously unrecorded in this part of Ecuador. By documenting the favored locations of wildlife species in forests and agricultural areas, we can assess their habitat preferences and identify priority sites to protect these animals. In the future, we will use camera traps to document the return of wildlife to reforested areas within the Coastal Conservation Corridor. Check out some of the camera trap images in our online gallery! Ceiba is at the frontline of wildlife conservation on Ecuador’s central coast. We continue to pursue the goal of a biological corridor, with local landowners participating in restoring tree cover to improve habitat quality and shelter populations of rare and threatened animals moving across the landscape. With lots of effort and a little luck, we can help these species make a comeback. Donate a camera or be a wildlife monitoring intern! Today, the 500 acre forest he spared from the axe is a source of pride and income, a protected area where students and visitors alike come to study and enjoy the exuberant nature that once covered the region, and sample Lalo’s delicious yogurt! Read the rest of Lalo’s story! 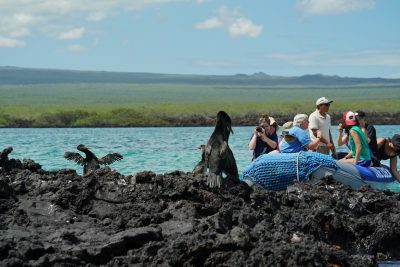 Is exploring the Galapagos on your bucket list? Are you amazed by the Amazon, and awed by the Andes? Do you seek active travel where you learn new things and make a difference in the world? Join one of Ceiba’s educational travel experiences! Education is integral to our conservation mission. Ceiba leads acclaimed study abroad programs for undergraduates, workshops for rural Ecuadorian teachers and farmers, field trips for local school groups, and internships for people from around the world. Now, we also offer tours to the Amazon and Galapagos, led by Ceiba biologists, that combine adventure, education, and comfort in some of the world’s most incredible places! Contact us at tours@ceiba.org for the amazing details.